We would be happy to accept old items into our collection of old stuff. Things that failed to reside in technical museums or antiquarian bookstores, yet were not thrown away can find a home here. If you live in Moscow, you won’t even have to leave your house—we’ll send a courier to your door. about the Metro, Metrostroi, etc. on typography, typesetting, history of books, etc. Art. Lebedev Studio thanks everyone who contributed to the museum. The exhibits have more than just decorative valuethey often appear in our projects and provide inspiration to the studios designers. 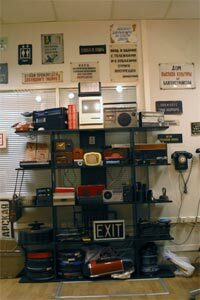 From time to time, some of these items get displayed at the exhibitions or seen on TV, in movies and print ads. We are always happy to lend our stuff to design studios and film crews on terms of self-collection, self-return and careful handling.